Find artworks, auction results, sale prices and pictures of Gudrun Lauesen at auctions worldwide. Lauesen, S976. H. 24 cm. white glaze. Signed Lauesen, S976. H. 24 cm. 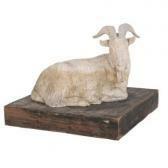 Gudrun Lauesen: A stoneware figurine in the shape of a calf, Royal Copenhagen. Signed monogram GL 1941. H. 8. L. 28 cm. 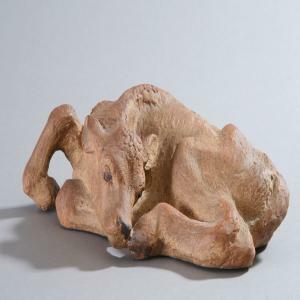 A stoneware figurine in the shape of a calf, Royal Copenhagen. Signed monogram GL 1941, 6/200. No. 20491. H. 8. L. 28 cm. Litteratur: Leif Lautrup- Larsen, "Stentøj. 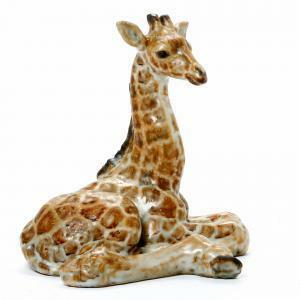 Den kongelige Porcelainsfabrik", s. 438.
gypsum, in shape of a giraffe head. Unsigned. H. 85 cm. 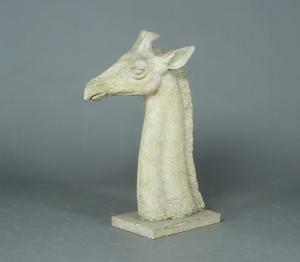 Sculpture of patinated gypsum, in shape of a giraffe head.